Carefully remove the flesh in large chunks, discarding the skin and bones. I definitely have to wear my reading glasses to do this! Mix with freshly cooked pasta, adding a splash of cream and a few capers or chopped dill. Some halved baby tomatoes or rocket leaves are an optional addition. 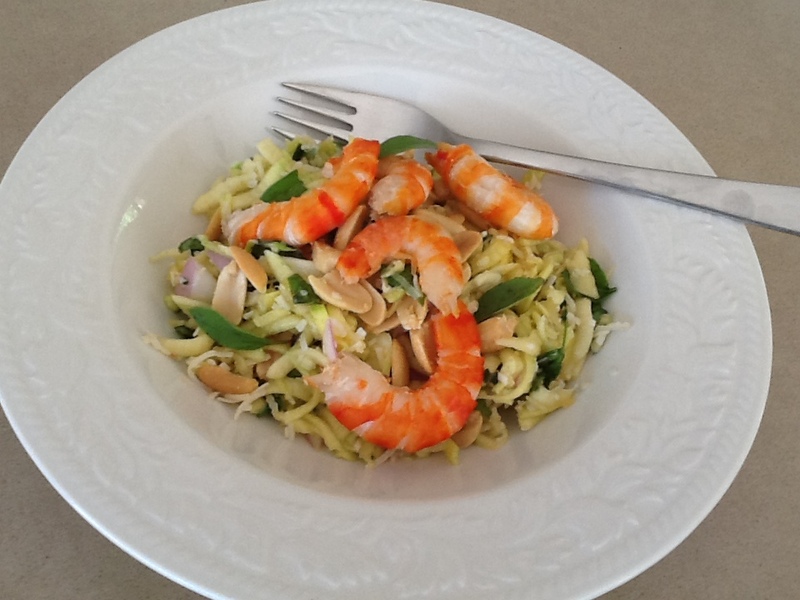 Or make this Asian salad which is perfect for a hot summer’s day. Dressing: Place onions, garlic, chilli and peanuts in food processor and process until you have a paste, stopping to scrape down the sides halfway. Place paste in a saucepan with remaining dressing ingredients. Simmer for 3-4 minutes then leave to cool. It should be thick and a bit sticky. Meanwhile arrange salad leaves on two plates. 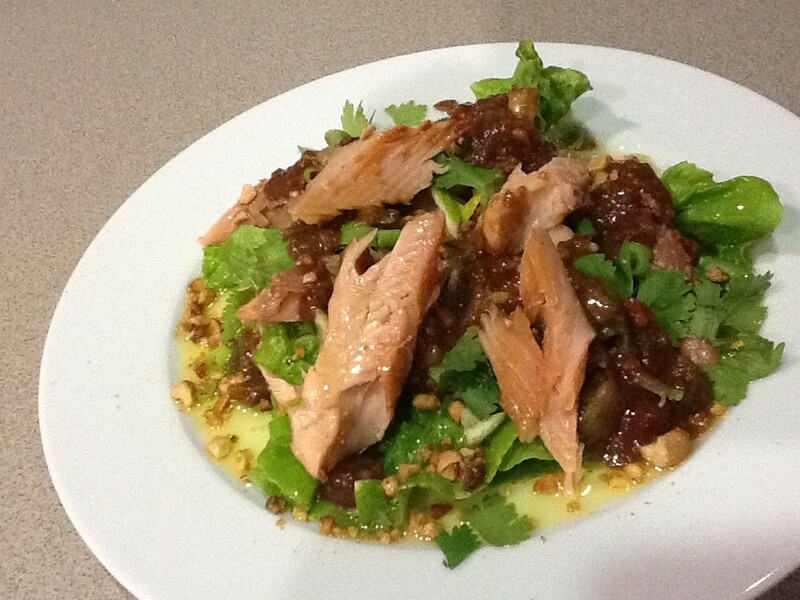 Top with the trout pieces, the lime, peanuts and coriander leaves. Drizzle with some of the sauce, then drizzle a little olive oil around the edge of the plate. Any leftover dressing is delicious served with cold roast meats. Note: some supermarkets sell smoked trout fillets without skin or bones. Variation: to serve as finger food, separate the leaves of 2 heads of chicory (witloof or witlof) and top each with a piece of smoked trout, the remaining toppings and some of the dressing. 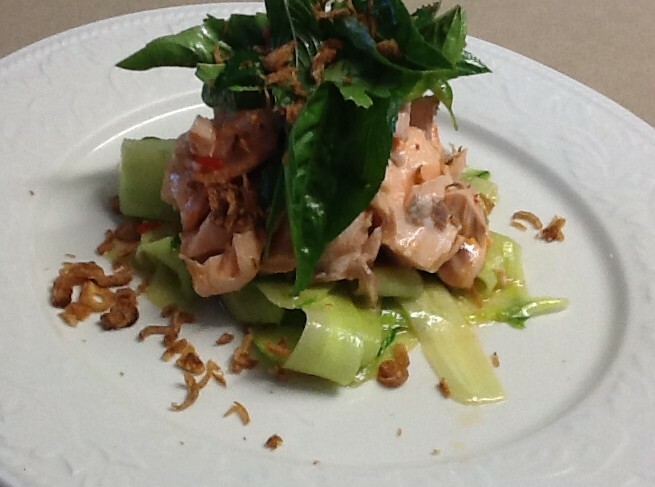 This entry was posted in Recipes and tagged asian, easy, fish, lunch, quick, salad, starter by Linda Peek. Bookmark the permalink.